What would you visit Goa for? Decidedly for its atmosphere, its wonderfully fresh seafood cuisine, its people, its churches and temples, but more than anything else, for its beaches. Pale gold sand stretching for miles on end, fringed with coconut palms. Isolated coves separated by cliffs reaching into the sea. The sun, the sand and the surf create an enchanting wonderland, which is simply irresistible. Goa is located on the western coast of Indian Peninsula and separated from Maharashtra by the Terekhol River in the North, Karnataka in the South, the Western Ghats in the east, and Arabian Sea in the west. Goa is located between the latitudes 15°4800 North to 14°5354 North and longitudes 74° 20'13" East to 73° 40'33" East. Goa has a moderate temperature showing negligible variations in different seasons. May is the hottest month while January and February are the coldest. There is a prevalence of tropical weather rest of the year. Southwest Monsoon brings rain in Goa between June and September. Goa is a place for visiting any time of the year. But the time Goa reveals itself best would be the peak of monsoons from mid July to late September and peak winters from November end to mid February. Goa was a part of the Mauryan Empire, around third century BC. Vijayanagar Empire established itself for almost a century. Soon, the Dutch, English, French and Portuguese, all began struggling for its possession. Ultimately, in 1510, the Portuguese conquered Goa. Having ruled for around four centuries, in 1961, fourteen years after the country's independence, the Portuguese had to leave Goa. In the local dialect, Goa is often referred to as 'Goa Dourada', (meaning 'Golden Goa') because of its beautiful beaches, forts, churches, waterfalls, seminaries, and caves. Anjuna is a small village in north Goa, on the shores of the Arabian Sea. It lies 18 km away from Panaji. Popularly known as the freak capital of the world, Anjuna is just the right place for lazing holiday makers. North of Panjim lies the huge 7 km sweep of Calangute, located in the Bardez taluka. The scenic natural beauty of the peaceful coastal countryside has turned Calangute into one of the most popular destinations in the world. 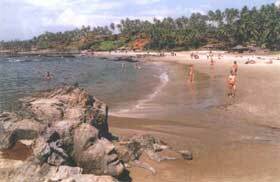 Colva and Benaulim are two famous beaches located on the golden shores of the Arabian Sea in south Goa. They are still somewhat untouched by the vagaries of the fast life encountered elsewhere in Goa. It lies 39 km away from Panaji. Two km further ahead from Colva is Benaulim. Seven kilometers west of Panaji, the Dona Paula Beach is nestled on the southern side of the rocky hammer-shaped headlands that divide the Zuari and Mandovi estuaries. The proximity of the beach to the capital city makes it a popular tourist attraction. The soft white sands, the black lava rocks, the coconut palms, the lush green landscape, nature playing its own music, and the sea turning from aquamarine to emerald green-Vagator and Chapora, overlooked by a 500-year-old Portuguese fort, leave each visitor awestruck. Quite unexplored till date, these two beaches are known for their peaceful, laid-back atmosphere. 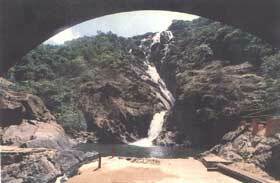 It is located in North Goa around 24 km from Panaji. While nature has been so generous to Goa, man too has contributed a lot to Goa's beauty. The strong Roman Catholic community, with the active support of the erstwhile Portuguese rulers, has had a number of churches built in this picturesque locale. In Panaji, one must visit the church dedicated to our Lady of Immaculate Conception, and the Chapel of St. Sebastian. The Goa State Museum, the Secretariat, the statue of Abbe Faria in the capital is a must see for lovers of art. The largest of the churches in Goa, the Se Cathedral is in Old Goa and is flocked by thousands of tourists every year. The holy shrine of Basilica of Bom Jesus, also in Old Goa, houses the mortal remains of St. Francis Xavier. It is a famous pilgrimage center among the Roman Catholic devotees. Other famous churches are the Convent and Church of St. Francis of Assisi, Church of St. Cajetan, Church of St. Augustine Ruins, Church and Convent of St. Monica. Fort Aguada is worth a visit to savor the nostalgia of the Portuguese regime, especially in its lighthouse and the Aguada jail. The Terekhol Fort near the Arambol beach has been now converted into a hotel. Besides these, to get a glimpse of the Hindu population in Goa, one has to visit Ponda. The Kerkar Art Complex in south Calangute is also an important tourist center. Due to the strong Roman Catholic influences, most of the festivals of Goa are Christianity-specific. Feast days, thanksgiving, monsoon celebrations, processions; all mark the Goanese festival calendar. Shigmo, the Goanese version of Holi, is celebrated in the month of February/March. The Feast of Our Lady of Miracles, celebrated 16 days after Easter, is secular by nature and is celebrated with pomp and gaiety by both Hindus and Christians. Igitun Chalne, held at Sirigao temple in Bicholim during May, is one of Goa's most distinctive festivals. The main attraction of the festival comes when devotees of Goddess Lairaya walk across burning coals to prove their devotion. The Feast of St. Anthony in the month of June is also significant as it marks the beginning of monsoon. Besides such religious festivals, Goa is also known for its arts and crafts fairs, and food festivals. Dabolim is the main entry point for Goa situated at a distance of around 29 km from Panaji on the coast near Vasco da Gama. Most domestic airlines operate in Goa apart from chartered private airlines operating from UK and Germany. It is not difficult to reach Goa by trains, especially after opening of the Konakan Railway that connects Margao and Vasco da Gama to major cities in India. You can take trains from Delhi, Mumbai, and Bangalore to reach Goa comfortably. Goa, Maharashtra, and Karnataka state transport corporations operate from the Kadamba bus stand at Panaji. Frank Shipping operates a boat service between Mumbai and Panaji. Moving around in Goa is quite easy. One can find bus as well as car rental services. Several ferry services are also available.